I have received more inquiries about my shop made thickness sander than I have for any other post! Go figure! Though a thickness sander saves time I must admit that I love thicknessing thin stock the old fashioned way. 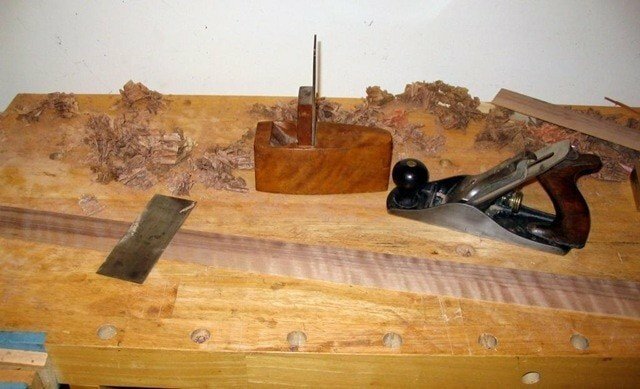 I use a toothing plane, a number of bench planes and a scraper. It works well, it is quiet, it produces shavings instead of dust and it keeps my upper body in shape! Here are a few more pictures to assist anyone out there who is thinking of cobbling a thickness sander together. It is a very simple and inexpensive device and it works well. There are several improvements I would make if I were to build another thickness sander but this one works well enough as is so it will probably be some time before I get around to replacing it. 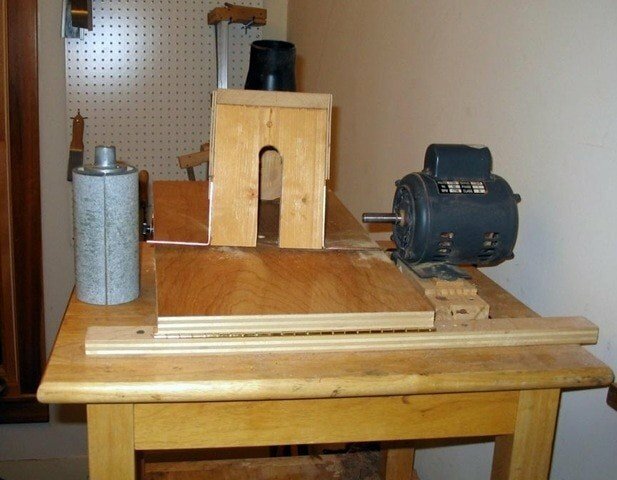 This device is used for thicknessing tonewood for musical instruments that is finished to less than an eighth of an inch in thickness. It would be just as easy to build a machine to work thicker material. The heart of this thickness sander is a 3 inch by 6 inch sleeveless sanding drum with a half inch shaft. These are available from a number of woodworking tools suppliers on the web for about $30.00. The drum is designed to receive ordinary sheets of sandpaper cut to size. I usually use 60-80 grit paper. The drum came with a coupler that fit on to the shaft of a 1/3 horsepower motor I salvaged from a cheap drill press that was falling apart. Since the drum is only mounted on one end I can sand a piece of wood up to 12 inches wide by making two passes. Someday I’ll make a press for installing frets out of the rest of the drill press. 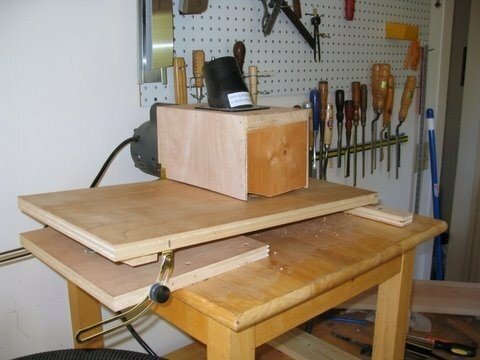 The base of the thickness sander is an end table I didn’t know what to do with. When I put it on top of my bench it sits at a very comfortable height. I use a bench dog to keep the thickness sander from sliding around on the bench while pushing wood through it. 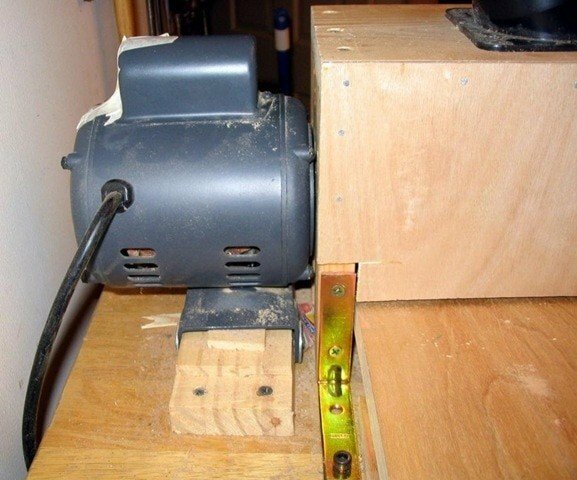 The dust hood is a wooden box with a slot cut to allow the motor shaft to pass through. there is also a large hole drilled in the top of the dust hood fitted with a connector that goes to the shop vacuum. The machine produces a lot of dust but almost none of it escapes using this setup. I would not recommend running this machine without dust collection of some kind. The table consists of two plywood boards with a hinge at one end. 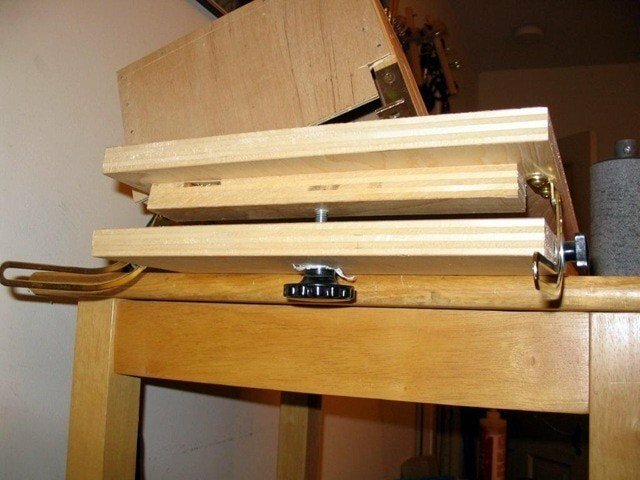 The thickness is set by turning a threaded knob that raises the other end of the table. The two lid supports are tightened so the table doesn’t flex from side to side. These supports are very flimsy but they work well enough. There are various wedges and screws that hold things together and allow for some tweaking to keep things lined up and square. I take light passes and move the wood through slowly. Sometimes it is helpful to slightly angle the wood as it goes under the drum so that the sanding drum is working the wood a little across the grain. To bring everything to final thickness I first wipe and vacuum as much grit from the wood as possible. Then I use a scraper to clean up the coarse sanding marks.